As human, we breathe and consume the oxygen contained into the air. The more exercise we do and the more oxygen we need. Most living creatures also need to breathe O2 in order to live. In aquaponics we are working with a whole ecosystem and most of the creatures are aerobic (they need oxygen). During the day, plants are doing the photosynthesis which consumes CO2 and release O2. In the same time the plants are breathing the oxygen from the air and release CO2. The plants breathing is happening both at the leaves level and the roots. This is the reason why most plants like to grow in a light soil well aerated where the roots can easily breathe. 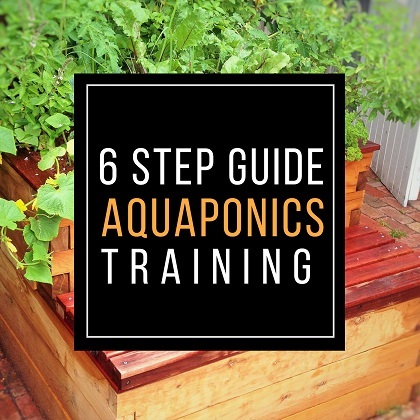 In flood and drain growbed aquaponics the roots are alternatively in contact of the water (when the water level is high) and in contact with the air (when the water level is low). This water level variation is therefore crucial for the plants health. A growbed designed without bell siphon or other type of flood and drain system will kill the plants in the long term. The bacteria needed in aquaponics are also aerobic (they need oxygen to live). They are responsible for transforming the fish waste into plant nutrients. Those bacteria are mainly living on the flood and drain growbed media. We understand therefore the major importance of the bell siphon to oxygenate those bacteria. Each time the water level is low, the bacteria have direct access to the air from the atmosphere. The fish are consuming the oxygen contained into the water. The oxygen contained into the water is absorbed by the fish blood thanks to the gills. The gills are actually equipped with very thin blood vessels and they allow the oxygen to circulate through. The oxygen will simply move from the area the most concentrated in oxygen (the air) towards the area the less concentrated (the fish blood). The more oxygen there is into the water and the easier it is for the fish to breathe. Your goal when it comes to O2. As Aquaponics grower, our mission is to keep an appropriate oxygen level for our ecosystem. The plants and the bacteria O2 needs are covered thanks to the Bell siphon. For the fish we must maintain a good oxygen level into the water. Maintain a good water O2 level. The oxygen concentration into the water is fluctuating in function of multiple parameters such as temperature, salinity, pressure… There is a maximum concentration of oxygen naturally present into the water that we call saturation. It is possible to over-saturate the oxygen concentration but it is done using pure oxygen and require costly resources. This is common practice in intensified aquaculture. We don’t use this option in aquaponics as the aim is to keep our system very sustainable and to minimize the resource needed. Our aim in aquaponics is to naturally allow the water to reach 100% saturation. So in our fish tank we have fish and a multitude of other organism all-consuming oxygen. On the other side we have the surface of the water where the water is in contact with the air and the gas concentration are constantly balancing. To allow the water to “recharge” in oxygen we need to have a maximum of contact area between the air and the water. In streams and rivers, the water falls are area where the oxygen is high because during a water fall some air bubbles are trapped and mixed with the water. This increase the surface area and therefore balance the concentration of gas water/air. In aquaponics there are 2 common ways to increase the surface of contact air/water. The obvious one is to equip the system with a decent size water pump. Therefore when the water flushes back to the fish tank, it creates a water fall which increase the O2 level into the water. This technique works but unfortunately it involves to move a large volume of water to produce oxygen and this consumes a substantial quantity of electricity while there is another technique significantly more efficient. What I recommend is to use an air pump and to blow some air directly in the fish tank. This technique is very efficient and increase the oxygen level with a very reasonable power consumption. What I recommend is to equip the system with a limited size water pump (twice the growbed volume per hour) and to equip the fish tank with an air pump. this also helps my PH. Let me know if i need increase the O2 pls. If your fish density is reasonable and they are comfortable then it’s fine but if you have the airpump it’s always better to live it on 24/7.